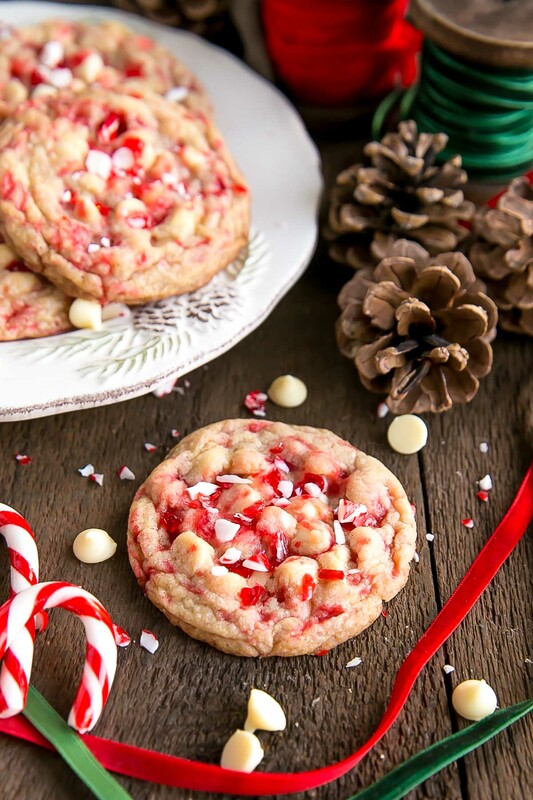 These White Chocolate Candy Cane Cookies are crispy, chewy, and delicious. The perfect sweet treat for the holidays! The holiday season isn’t long enough for all the baking I want to do, especially this year with my sister in town for most of November and a new(ish) puppy that has taken over our lives (in the best way possible). I’m still trying to come up with a plan of attack for the Christmas tree this year — how to keep her away from it while we’re putting it up and just in general once it is up. Do we leave ornaments off all of the bottom branches? Barricade the tree somehow? Put her playpen around it?? Open to any and all tips! 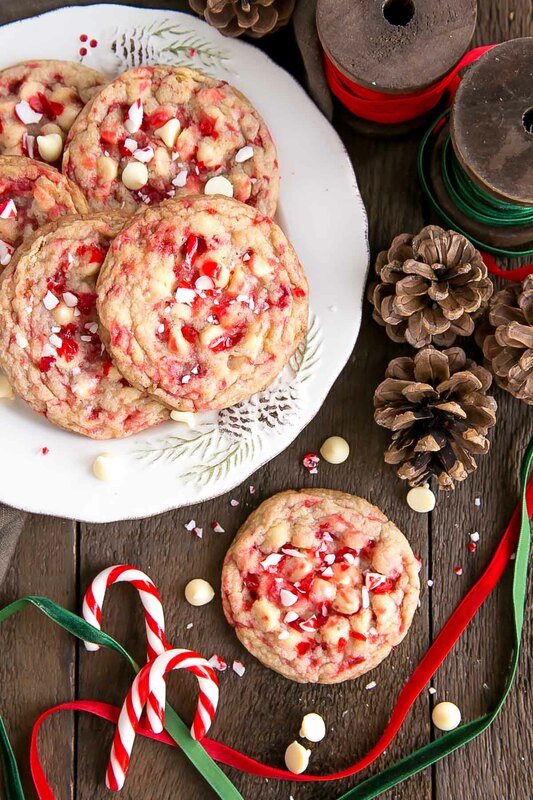 These White Chocolate Candy Cane Cookies that I bring you today are a revamp of an old holiday cookie recipe from a few years ago. Candy canes and peppermint aren’t everyone’s cup of tea. They’re a staple during the holiday season, but not everyone likes the taste of mint, which is understandable. Personally, I am a huge fan of the mint and chocolate combo, especially when paired with dark chocolate. If you’ve been following along, you know that I am not a fan of white chocolate, but honestly, white chocolate pairs so well with certain flavours, and peppermint happens to be one of them. I swear, I’m not being converted to a white chocolate lover (it’s technically not even chocolate after all), but I’m now convinced that it pairs well with both gingerbread and candy canes! White chocolate does add for more sweetness though, so these cookies are not lacking in that regard. 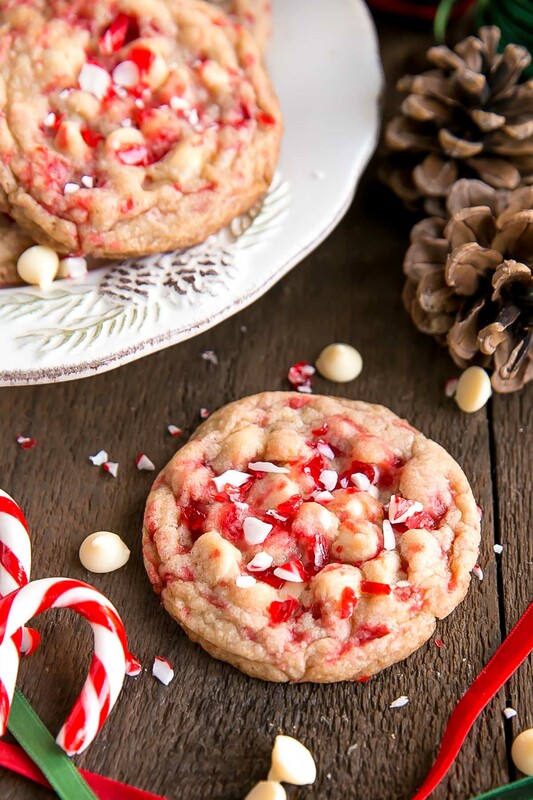 These White Chocolate Candy Cane Cookies are super easy to make. 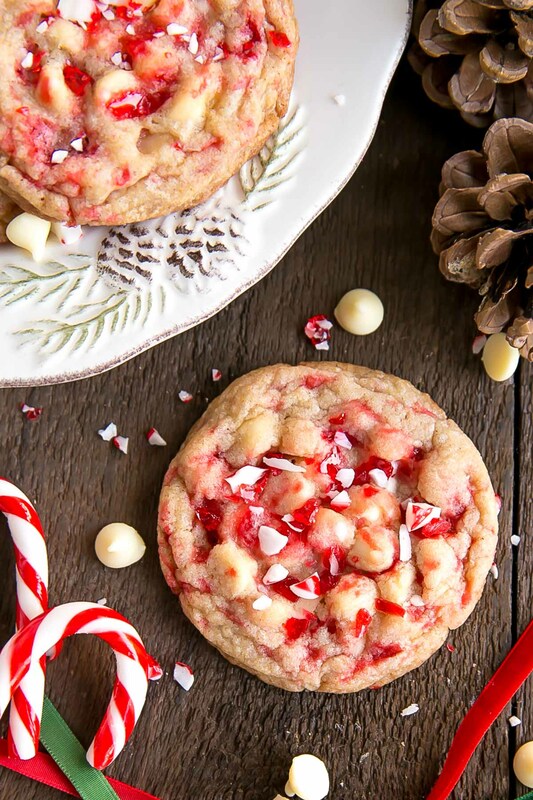 Crush up some candy canes and throw them into a standard cookie dough. The first time I made these my food processor was being temperamental, so my candy cane chunks were a bit large. Not wanting them to turn into candy cane powder, I stopped pulverizing before I should have. They still turned out great, but maybe a bit more crunchy than expected. 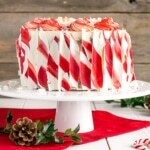 The second time making these I used store-bought crushed candy canes due to laziness, they worked perfectly well and would recommend you go this route if they are easily available to you. Either method will work though! One thing that I didn’t do with this dough, which I do with all my cookie doughs, is to chill it. This, again, was partly due to laziness, but I was also under a bit of time pressure (remember the sister and puppy??) so I just scooped them, rolled them, and popped them into the oven. Honestly, they worked perfectly fine. They maybe spread a bit more than they would have had I chilled the dough, but again, either method will work great. I never did try freezing them. I suspect they would do ok in the freezer (sugar and candy doesn’t usually due to moisture), but the candy cane parts will get stickier/chewier. Ideally I would store them in an airtight container separated with parchment. They’ll last a couple weeks or so this way. And OH before I forget, I have a tip for you… I am obsessed with perfectly round, pretty cookies. I don’t like when they come out lopsided and uneven due to the chocolate chips or other additions. What I do as soon as they come out of the oven is I grab one of my metal cookie cutters (one that’s larger than the cookies that bake up), I place it over the baked cookie and nudge the cookie cutter in a circular motion around the outside of the cookie to bring in any uneven sides. I hope that makes sense… This only works when the cookies are straight out of the oven and haven’t quite set yet, so you have to be a bit speedy about it. 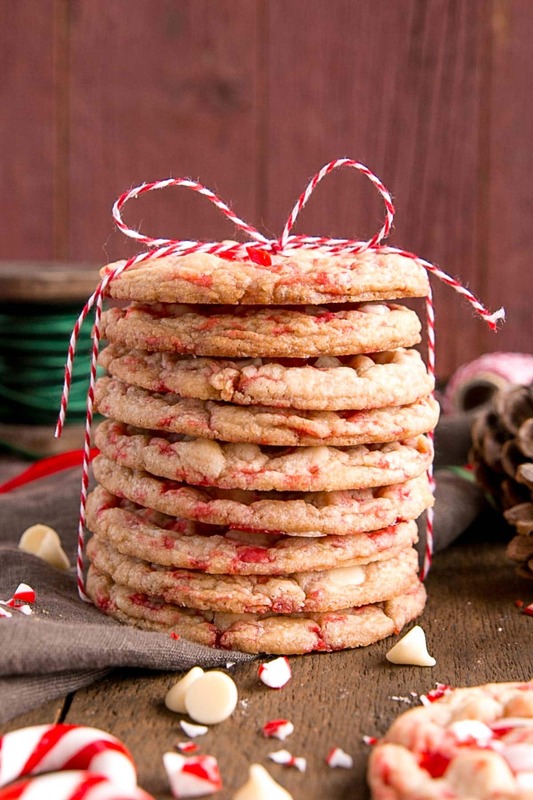 These white chocolate candy cane cookies are the perfect burst of flavour this holiday season. 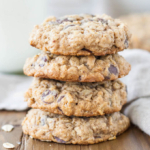 If you’re not a fan of white chocolate like me,these cookies might just convert you, or you could swap the white chocolate for any other kinda and have an equally delicious cookie on your hands! 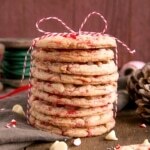 These cookies are on the sweeter side due to the candy canes and white chocolate. You can cut back on either of you like or use a different chocolate, or add a bit more salt to cut the sweetness. I didn’t chill the cookie dough but it should be fine too, the cookies might not spread as much. Recipe can be doubled if you’d like to make more cookies. I used store-bought crushed candy canes due to laziness, but you can crush your own. I used a medium cookie scoop for these cookies, but you can use a large one if you want bigger cookies. You’ll need to bake them for longer though. Originally published on December 6th, 2015. Recipe, photos, and post have been updated. 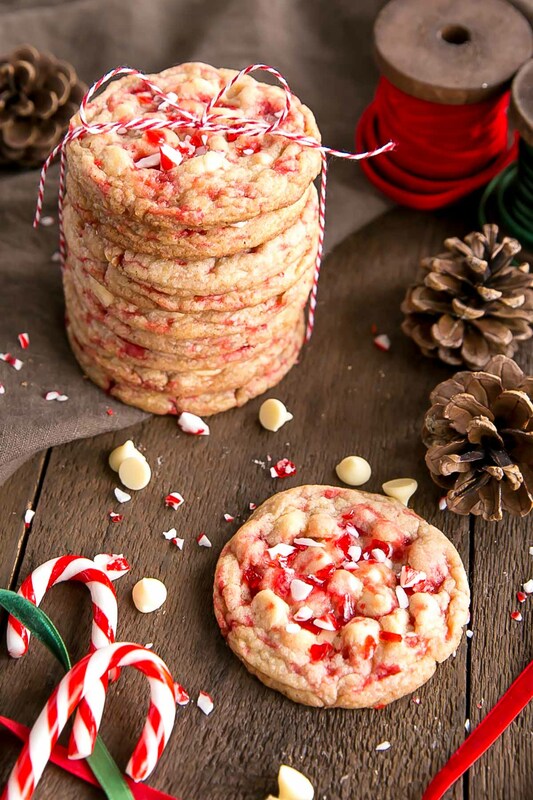 These White Chocolate Candy Cane Cookies are crispy, chewy and delicious. The perfect sweet treat for the holidays! Beat butter and sugars with an electric mixer until pale and fluffy (approx. 3 mins). Add egg and mix until fully combined. Add vanilla. Reduce speed to low and add in flour mixture. Mix until just combined. Add in crushed candy canes and chocolate chips and mix until just incorporated. Using a medium cookie scoop (1 1/2 Tbsp), scoop cookies onto baking sheets. With floured hands, roll each one into a ball. Bake for 10-12 mins until cookies are golden brown on the edges. Cool completely on baking sheets. Hi Olivia! These look delicious! Do I need to flatten the balls of cookie dough with the bottom of a glass or anything before baking? Or do they flatten on their own. Thanks! Hi Anna! They flatten on their own. These are gorgeous cookies! And I love the tip on how you make them perfectly round with the metal cookie cutter. Duly noted! So perfect for the holidays. Thanks so much Cindy! Hope you have a wonderful holiday season! Funny story, I once made cookies similar to these except they had peppermint extract as well and instead of using peppermint extract I accidentally used mint so it tasted like toothpaste. But these look good! Lol! Too funny, not exactly the kinda flavour you want out of your cookies 🙂 Thanks for sharing! Hi Cris! Yes, you can make them any size you like, but if you make them smaller you’ll need to adjust the baking time. How many cookies does this typically make? These cookies look so yummy! Thanks for linking up with What’s Cookin’ Wednesday! I love love LOVE these cookies Liv! They just LOOK like Christmas! Pinned my friend! 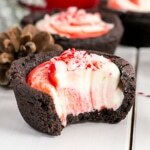 I’m not into white chocolate but my husband is and these look delicious! I’m looking for something different to make for our holiday party this year and this may be just the thing. Nice cookies for Christmas! With white chocolate.. Yummy! I could not agree more with you that the holiday season isn’t long enough to fit in all the baking projects I want to do! And now my list just got longer, because these cookies look fantastic! I’m sure these cookies are phenomenal on their own, but also: how amazing would they be as an ice cream sandwich with some peppermint ice cream?! 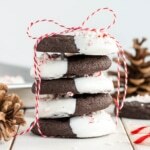 Oooh great idea….They would work perfectly as ice cream sandwich cookies!! And thank you!! 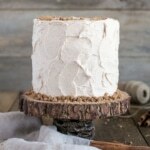 White chocolate can be fun to bake with. I love it with peppermint too. These cookies are perfectly golden brown. these look so good! Pinned & Stumbled!